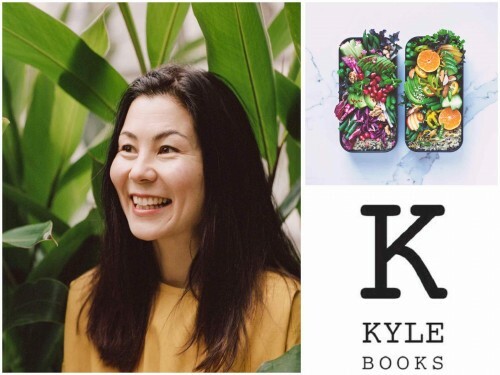 Kyle Books (part of the Octopus Publishing Group) has acquired Bento Power: The Magic of Brilliantly Balanced Lunchbox Recipes by Sara Kiyo Popowa aka Shiso Delicious. Judith Hannam, Editorial Director at Kyle, acquired World Rights All Languages from Jonathan Conway at Jonathan Conway Literary Agency Ltd. after a five-publisher auction. Many people bring their lunch to work to save money, time and to help control what they are eating (no hidden nasties from processed shop-bought food), but sometimes it’s hard to think of interesting, nutritious things to make. Sara has come to the rescue with her vibrant, fun and inspirational approach to lunch boxes. She uses a basic range of Japanese ingredients, easily sourced at a supermarket, and concentrates on having 5 clear elements: complex carbs, protein, green leaves, fruit/veg and seed sprinkles, as well as the 5 colours used in authentic Japanese cooking of red, white, black, yellow and green. Sara Kiyo Popowa was born in Sweden with Bulgarian-Japanese roots and went to study in Japan before settling in the UK. Creative by nature, she has had careers as a dance and visual artist and a graphic designer before founding Shiso Delicious. After a trip to Japan with her then husband-to-be, Sara started making him healthier versions of bento, to rescue him from the sad office lunches back home. She soon amassed a following on Instagram sharing her creations. Bento Power is a comprehensive collection of the bento recipes developed, shared for the first time, in Sara's personal voice and distinct photographic style. Sara’s food is always motivated by getting the most nourishing, natural and delicious results in the fastest and most low-impact way possible. She inspires thousands of people daily with her exemplary approach to food and ingredients through social media, events and workshops.